Drain the chick peas and blitz with the other falafel ingredients (apart from the oil) in a food processor until you have a coarse paste; season with black pepper and chill for 1-2 hours. Heat a deep-fat fryer to 180 ̊C or fill a large, deep saucepan 1/3 full with vegetable oil and heat to 180 ̊C using a sugar thermometer. Roll heaped tablespoons of the mixture into balls (you should make about 30, each around the size of a golf ball). Fry in batches for 4-5 minutes, until crisp, golden and cooked through (cut one in half to check). Drain on kitchen paper. Toss together the tomatoes, cucumber, herbs and lemon juice; season. 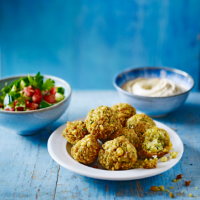 Serve with the falafel and houmous, piled into toasted pitta bread with chilli sauce, if liked.